The Durrington-born defender, 27, played a full part in County's fourth round replay 2-0 win over Championship side Middlesbrough at Rodney Parade last night. The winners of that tie knew Pep Guardiola's Premier League champions were waiting in the next round and the Welsh side managed to book a date with them. 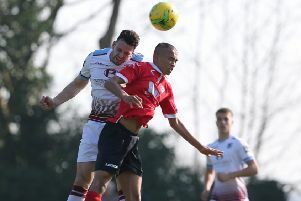 Demetriou, who started his career at Worthing and also enjoyed spells at Bognor and Eastbourne Borough, featured as County knocked out former Premier League champions Leicester City in round three earlier this season. Michael Flynn's men also knocked out Championship side Leeds United in the competiton last season before bowing out in a replay against Tottenham Hotspur at Wembley. Newport's fifth round tie against mighty Manchester City will be broadcast live on BT Sport on Saturday week (5.30pm).